Before removing the hose, check the depth of the inserting portion and the clamp position in order to restore it surely. change a deformed or dented clamp for a new one. in case of reusing the hose, install the clamp on the hose where it has a clamp track. 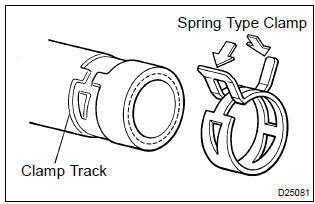 for a spring type clamp, adjust it by adding force to the arrow mark direction after the installation.